This place was right in the center and had the sweetest beer garden right outside the rooms. The staff were always friendly and there was even a kitchen in our room which was perfect! Fulfilled my expectations - shower, bed, clean. I missed lockers and some extension cords that run to every bed. Staff are laid back and accommodating. Facilities are in development and missing some basic items (such as cookware/plates/glasses). Kitchen is minimal. No room lockers. Security could be improved. I like this location of Prague so worthwhile staying here a few days to check out the hood. Not a bad spot. Very cheap, and you get what you paid for. Decent facilities, but if you are looking for somewhere secure this is not the place. No keys aside from the front gate, and they recommend you sleep with your pasport/wallet/etc. on your person. In a good spot though, a 10 minute walk from the Old Town area and castle. This hostel is one where the value is you get what you pay for. 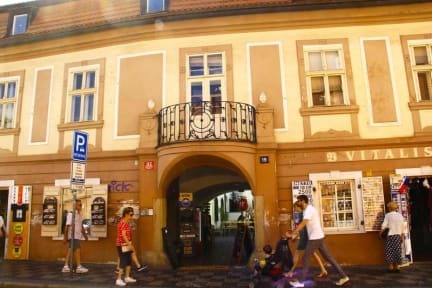 Really great location just a 10 minute walk to the Prague city center. The staff was friendly but the place was a little outdated. Beds were very creaky and the room was quite stuffy. Not much security so sleep with your important possessions. No hot water in Kitchen , WC. No basic facility of heaters in room. Some rooms may have heater some not. Needs to improve more. The location of this hostel was one of the only good things about it. When we first arrived we were shocked to realise that in the female rooms there was only one bathroom of a single toilet and shower between 8-16 people. Security was a big issue also, the doors into the rooms as well as bathrooms didn’t lock. Our rooms door couldn’t even be shut properly, nothing’s stopping someone from coming in off the street into the hostel and it’s dorms. Wouldn’t say there’s good atmosphere either. My hostel reservation was cancelled out without my permission after I book the room successfully because the owner wants to leave some rooms for Christmas. He said a bed costs 45 Euro per night during Christmas whereas I only paid about 10 Euro when I booked this room early in October. Also, there was some Portuguese people whose reservation was also cancelled. In my case, they said 'I can't give you the room.' and ignored me. However, In the case of Portuguese people, they paid even more.